BBI Group is developing the Balla Balla Infrastructure Project, which includes an iron ore transportation facility comprising an integrated port and rail infrastructure system. Image courtesy of BBI Group. BBIP includes development of a 50Mtpa iron ore transport infrastructure in Central Pilbara. Image courtesy of BBI Group. 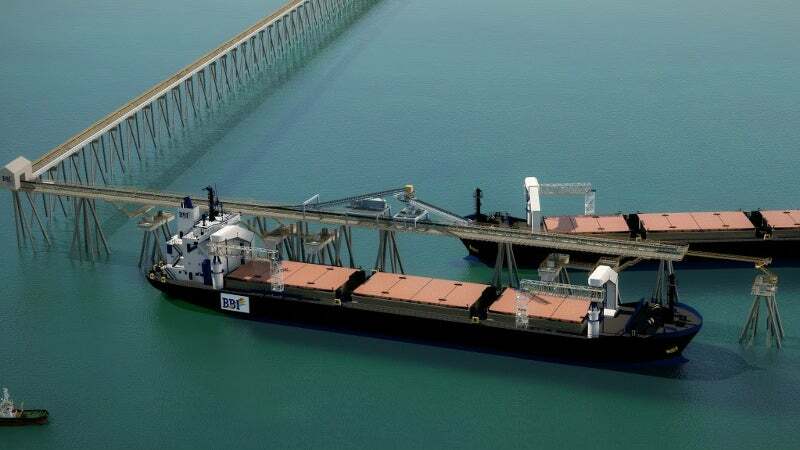 Conventional ship loader, to be used for the BBI project, will be capable of loading up to 11,500tph of ore and can load the ore from both sides of the wharf. Image courtesy of BBI Group. The Balla Balla infrastructure project (BBIP) involves the construction of iron ore transportation infrastructure at the Balla Balla Port, including a 162km railway line connecting the facility to iron ore deposits in the region. Linking the port on the Pilbara coast between Karratha and Port Hedland, the new railway is expected to minimise costs and increase high value exports of bulk iron ore from central Pilbara. Construction of the infrastructure project, including the foundation customer mine, is anticipated to start in 2018. It is expected to create approximately 3,300 construction jobs and 900 operational jobs. BBI Group, owned by New Zealand-based Todd Corporation and Australia-based Nyco, is developing infrastructure project at an estimated cost of A$6bn (approximately $4.74bn). The Central Pilbara region lies within the Proterozoic Hamersley Group, which is estimated to be approximately 2.6 billion years old. Most of the iron ore is hosted within the Brockman and Marra Mamba formations. The region is expected to host more than 12 billion tonnes of iron grading 56%-62%. It currently hosts the world-class Rio Tinto mines and the Fortescue Metals Group’s Solomon Hub system. Flinders Mines’ Pilbara iron ore project is considered to be the foundation customer mine for the infrastructure project. The project will also be supported by the Weelumurra iron ore asset in the Central Pilbara region. BBI acquired the asset through an agreement with Polaris Metals, a wholly-owned subsidiary of Mineral Resources. The iron ore facility at the Balla Balla port is estimated to have an initial capacity of approximately 50Mtpa of iron ore with a scope to increase in the future. The Balla Balla port is owned by the Pilbara Port Authority, and will be leased to and operated by the BBI Group. BBI proposes to implement an innovative, efficient and low-cost solution for the operation of the Balla Balla Harbour as part of the infrastructure project. The BBI port will be operated as a transhipment export facility, allowing the port development without requirement for any dredging, reducing capital costs. The port facility’s size can be increased through the installation of additional transhipment vessels and shore-side loading facilities. BBI is expected to use custom-designed transhipment vessels with a capacity to transfer 30,000t of iron ore. The vessels will use custom-designed material handling systems for unloading the cargo onto the bulk carrier. The vessels will be loaded by a conventional ship loader, capable of loading up to 11,500tph. The ship loader is capable of loading the ore on both sides of the wharf, and will be situated on a purpose-built wharf at the end of a 2.8km trestle jetty. The project will include the construction of dual-fuel gas-fired power stations at the port, as well as a rail load-out loop station. Fuel for the power station will be sourced from the Burrup Gas Line and supplemented by power from the grid via the Horizon Karratha to Port Hedland power line. Fortescue Rive gas pipeline will supply fuel for the rail load-out loop power station. On 23 January 2017, the Western Australian Government signed a state agreement for the construction with BBI Rail Aus, a wholly-owned subsidiary of BBI Group. The BBI railway line will be a 160km single-track standard gauge line connecting the port to the railhead and the stockyard, and leading into the central Pilbara region. The heavy-haul railway will have a design life of 50 years and be capable of carrying 40t axle loads. Each BBI rail is expected to hold approximately 23,100t of iron ore and comprise 170 wagons powered by three distributed power diesel locomotives, including two at the front and one at the rear. The round trip from port to port is expected to take 11 hours on an average. The current rail line will include the construction of a bridge structure on the road over the rail-bridge crossing the North West Coastal Highway, 12km west of the town of Whim Creek. BBI Group engaged China State Construction Engineering Corporation for the construction of the Balla Balla Infrastructure project. Insatech Marine specialises in fuel consumption systems and monitoring solutions for the maritime industry.